Growing up in an archipelago means that you cannot go very far from the ocean. Raised in Manila, the nearest ocean is the Manila Bay. Yes it may be filthy to swim there, but it still is an ocean. Of course, I’ve been to nice beaches in the Philippines too. That’s what I’m missing now. The ocean. Iowa is a land lot, smack in the middle of the continent. The east coast, or the Atlantic Ocean is 1200 miles away, or 19 hours of continous driving. The west coast, or the Pacific Ocean is 1700 miles away, or 27 hours drive. The south coast, or the Gulf of Mexico is 1000 miles away, or 16 hours drive. Forget about the north coast for that will be the Arctic Ocean, which is more than a week drive, plus you don’t want to be there anyway unless you are a polar bear. There are a few people who grew up here in Iowa who have never seen the ocean, which to me is hard to believe. No idea of the sight of the beautiful vast blue-green waters dancing in the light of the sun. No idea of what the sound of ocean waves lapping against the sandy shore. No idea of the scent of the ocean breeze and the salty ocean mist. No idea of what it feels to walk barefooted in the sand and wade in the warm ocean waters. 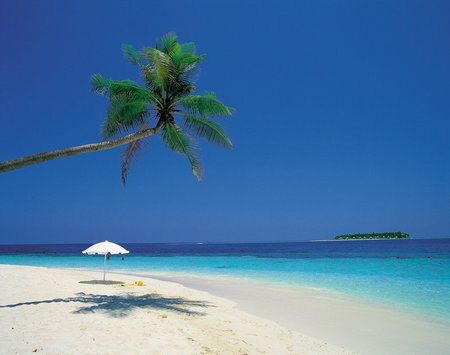 That leaves me day dreaming……….sitting idly in a beach…….. under a swaying coconut tree………. sipping fresh cold buko juice. Pinch me. Yes, the warm tropical sun, the sandy beaches…………..Remind me, why did I leave the Philippines again?